Received a few corrections about the critter above from this post (which I also fixed), including this in-depth update from Fred Heath. Thanks to all who help me keep telling the truth on this blog! Carol Otto reminded me to take another look at Marty’s beetle photo. My first reaction, as was Carol’s, was that it was a whirligig. Her first clue was that it was on the surface of the water. Although whirligigs can sometimes go under water to grab a morsel or escape from a predator, because of their buoyancy they can’t stay under unless they hold on to submerged vegetation. The water scavengers on the other hand spend most of their time under water. In addition, the shape of this beetle looks just like a typical whirligig. However, since I had no idea what a water scavenger looks like, I certainly had to double check. 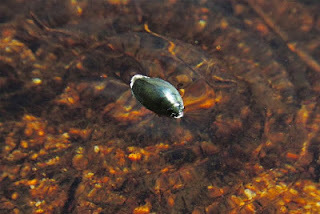 In my books and on the internet, although both families of beetles have many variations, the water scavengers have slightly longer bodies while the whirligigs are more compact and pumpkin seed shaped. This is a relative thing and doesn’t hold for all species. One final difference (in general…again with lots of exceptions) is the small triangular plate (called a scutellum) sandwiched between the elytra (front wings) and the thorax is usually obvious on the water scavengers, but missing or very small in the whirligigs. In Marty’s photo there is a strong reflection of light at the spot where the scutellum might be, but I believe if it was a water scavenger the triangle would be clearly visible. Now that I know there is a such a thing as a water scavenger, I will be keeping an eye out to see if I can find one in Sabino Creek. Found an idea on internet that when whirligigs swim in circles they may be generating waves they can use like echolocation to find prey or other whirligigs. Intriguing.